Hi, I don’t think you need to fear being accused of being a “feminazi” or not acknowledging Murray’s tennis abilities (I think he will be pretty sure now of his abilities!!). To me, you are pointing out a disturbing truth about the dominant voices in contemporary media which was reflected clearly in the recent reporting of the wimbledon championships. The reporting has exposed a widely-held assumption that sports events are about men primarily and women secondarily in media people’s mind. The headlines about Murray’s “victory” has revealed a usually masked sexism, clearly unmasked. And, as a woman, I feel quite disturbed, outraged, unsettled and disheartened by the overlooking of “woman as champion”. Thank you for taking the time to write about this incident of media reporting. No apologies needed! I think this article a bit pathetic. I follow tennis and frankly have never heard Murray described as the first BRIT to win, only as the first British male tennis player to win since Fred Perry. That achievement deserves recognition. 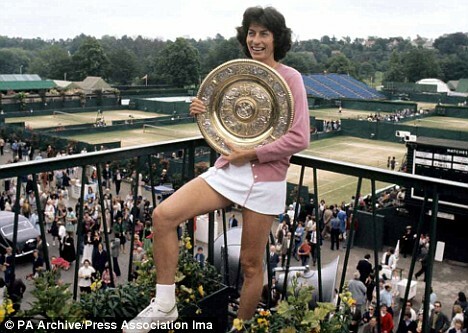 I am female, and I find Virginia Wade very antiquated in many of her current views and generally pretty unsupportive. Its strange she had criticised Murray for taking on a female coach and described fellow grand slam winner, Amelie Mauresmo, as mentally fragile. I dont see Wade as a current role model for females, despite winning Wimbledon, or Sharapova as someone to be celebrated either. There are a great many female players out there more deserving. Thanks for your comment. I believe my article gave Murray appropriate credit for his incredible achievement. It was a fantastic match! As I wrote in my article at the time, the headlines from the Times, the Telegraph and the Daily Mail didn’t specify “British man,” but said Murray was the first “Brit” to win at Wimbledon in 77 years. I also mentioned that I knew very little about Virginia Wade, other than what I had learned in researching the article. I’m bummed to hear she has been unsupportive and antiquated in her ideas. However, I don’t believe I pointed to her has a particular role model in my article. I simply wanted to draw attention to her, and other female tennis players, as the incredible athletes they are. Something surfaced about this recently, with John McEnroe making a comment about Serena Williams being the greatest female tennis player in the world, but being only about number 700 when compared to the men. Comments like his, and the headlines I referenced in my article, show how so many people think of the men’s singles as the default norm, and the ladies singles, or the doubles, are not as important or valid. It’s how it is, and I think it’s healthy to acknowledge these biases (which we all have) and push ourselves to think about where they come from.